Your fairest one of all smiles sweetly from this ultra-girly photo wrapper, perfect for any princess party. Design: Front photo in a fancy frame with vertical background stripes. 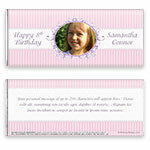 Personalization: Front photo, greeting and name, back message. Recommended Photo Size: 480 W x 387 H pixels.